I am a creature of habit, in the oddest ways. I stopped blogging in June because I went on a road trip and I was super busy with that, but also my computer screen cracked, and not just a little crack, it was such a significant crack I could not use my macbook pro. I was devastated and annoyed, I have a back up computer, a HP laptop, and it's a good computer, but it's just not my Macbook. So aside from not writing anything about what I have been up to for the last 6 months of this year, besides in this last month as I get back into blogging, I haven't been doing any writing at all not even on my novels. I could say I was mad at myself but I knew what I was doing and I just couldn't bring myself to type on the HP, the tracking pad is much to sensitive and when I type on it I get the urge to throw it from time to time. The main reason for this road trip was to go out east to celebrate the life of a man who was taken from this world too soon. My friend Estelle was making the journey and I knew it would be difficult and I didn't want her to have to do the journey alone, especially if she felt like she'd want the company. She was happy to have us and I was happy I was able to make the trip with her. 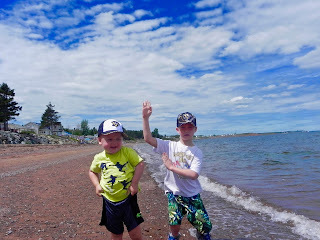 We travelled from NYC to Pugwash, Nova Scotia in one day. That is an epic drive and really should only have taken 12 hours but with traffic and stuff took us 18 hours. We have the best children ever though. There were no complaints in the car, they have been trained by this point to go to the bathroom when we tell them and not ask for extra bathroom breaks. It was a crazy long drive, but we made it to Pugwash and fell into a deep sleep! Even though we were only in New York City for like an evening it still deserves it's own blog post because I mean it was NEW YORK CITY!!! I have wanted to go to New York City for the longest time and even though I wasn't there for three or four days to explore every area and every borough (which i don't think is even possible in three days) I still had a great time. When we began planning this road trip, we were initially going to zip into the states and take the shortest way there. 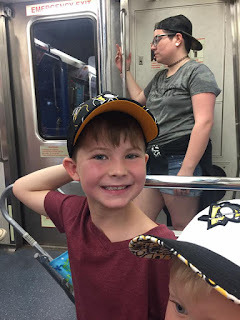 I then started looking at a map and suggested that maybe we could do a little detour and stop in Pittsburgh so Lil Man could see where his favourite hockey team plays. Estelle was agreeable to this so we began plotting out our journey. Once we crossed into North Dakota it was a long journey through prairie lands. North Dakota was pretty, and some of the places were well named. Devil's lake seems like it had a very appropriate name. Yeah it's a long hashtag, but it's the hashtag I used for sharing photos of an amazing road trip I went on this summer with my best girlfriend Estelle. 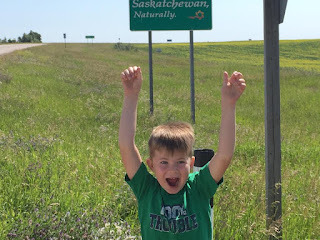 We took our youngest kids, her two girls, my two boys and we drove across the United States and Canada for what can only be described as a cathartic and epic road trip! I don't know about you but I love travelling and I really love travelling by car. There are things you will never experience if you only fly to your destination. Can road trips be utterly dull and uncomfortable, absolutely, but then you should pick better people to travel with. And I don't know there is just something about getting in a vehicle with a friend and driving somewhere random for no other reason than to go some place new. Don't let the frown fool you, he had a good time, he was just pretending to be sad. In fact he wanted my camera and because I wouldn't let him have it he decided to put out the big lip!! Canada is now 150 years old! That's a pretty significant event especially if you consider that our first 150 years have been fairly peaceful, there haven't been a lot of wars fought on Canadian soil or disputes about Canadian borders. I don't know if there are many countries in the world who can make that claim. Canada is celebrating our 150 in a variety of ways, free park passes, free library cards (thank you RDPL!! ), big fireworks on Canada day, and many more. I am happy to partake in them all. Canada is a wonderful country and I am so happy to call this place home! I look forward to the next 50 years of Canada being a shining example of what the world should strive for, even if we forget parts of our country every now and then (I'm looking at you Mr. Prime Minister). We did four big field trips in June with the class. June is such a hard month because most students have checked out of school by the first so we didn't want to do anything too taxing on them. So we booked a lot of field trips to let the students enjoy some amazing locations within a half an hour drive of the school. The first place we took the kids to was the Thuluum Tulip Farm just east of Red Deer. It was a very neat experience and the owners were amazing! I was so happy we got to go and the students all seemed to really like this trip. It became the benchmark to which all other field trips would be measured. The next trip we went on was a walking tour around Red Deer. We visited 10 statues that were erected to show the history of Red Deer. The statue above is Mr. Mann who conducted the Red Deer Royals and a few of our students had known him. This was a long day of walking but the kids did great and we had a lot of fun at the spray park during lunch! I work with two very different groups of kids, but I am fond of each of them for different reasons. One reason I love working with these kids is that they always keep me on my toes. The first group each student is vastly different but they find small joys in places where I have forgotten to look. They often need more help navigating the social regulations of society, but more often than not they are more accepting of each other's differences. A lot could be learned by watching them accept people for who they are and not what they can do. This group of kids will often scare other teachers because they "don't know what to do with them", but that for me is thinking too globally, get to know them, form a relationship with them and you will see that what you need to do isn't really all that different than what you are already doing. Oh the Places They will Go! Twelve years ago these same students walked in front of their parents at a Kindergarten Grad Ceremony, celebrating that they learned their ABCs, their numbers to 10 and how to share and care for one another. After a lot of hard work, social structuring in their peer groups, this group of students gets to say that they graduated, they put in the work and they are about to leave high school behind them. Never again in their life will they feel a triumph like this (unless of course they go to become a doctor and do another 12 years of schooling in a row). This is a time in their life that they can look back on and know they made it, they are on the precipices of adulthood. Those carefree days of no bills, no responsibilities are falling behind them faster than they realize.